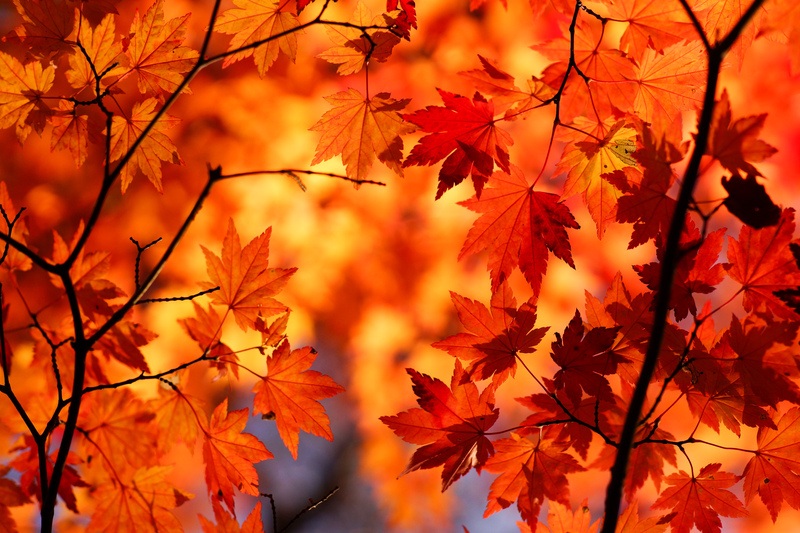 “No spring nor summer beauty hath such grace as I have seen in one autumnal face.” – John Donne. Unlike Sakura (cherry blossom), which comes in Southern Japan first, Koyo (autumn leaves) starts in Northern Japan. Autumn in Hokkaido usually arrives around mid September on the highlands. While moving to the southern part of the country, it slowly changes every leaf on its way, to a colourful flower. In this harvest season, the Japanese traditionally go out for Momijigari (autumn leaves viewing). Momjigari is also called as Kanpukai in Hokkaido. 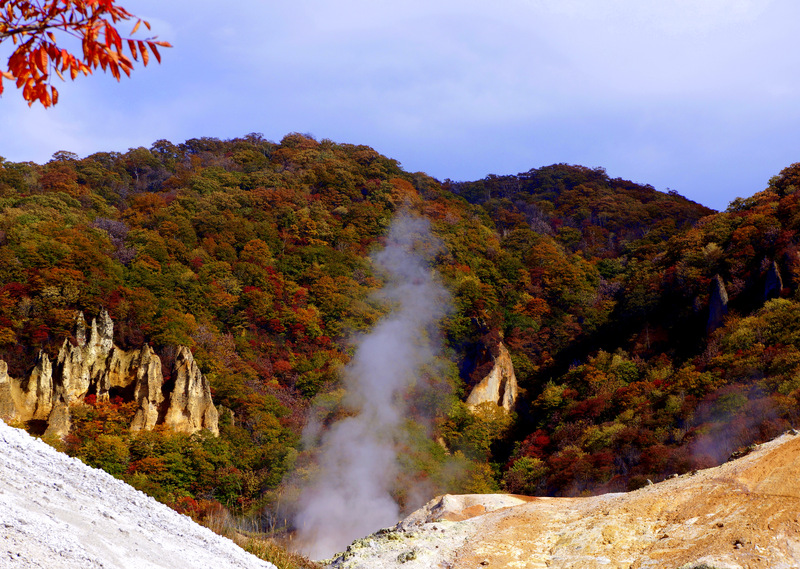 There are many breathtaking locations for autumn leaves viewing in Hokkaido. Below is a travelling guide with information on the sites, along with the best seasonal seafood to enjoy during autumn. 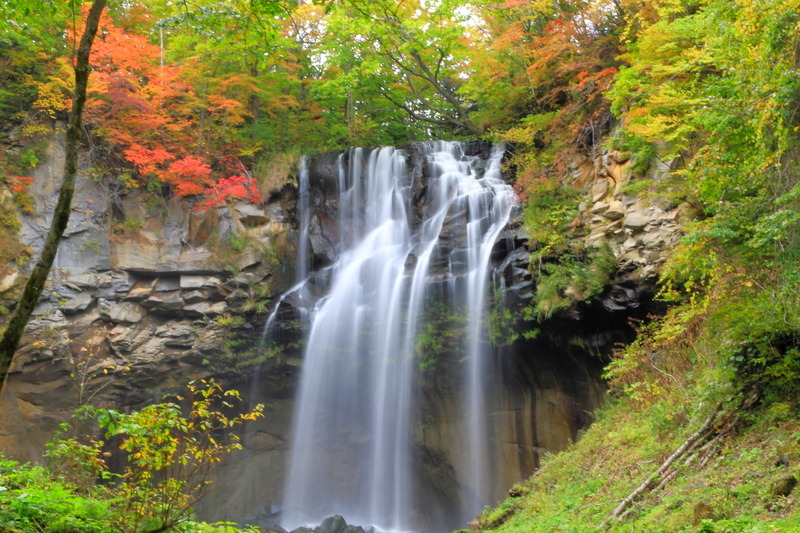 Takino Suzuran is one of the most popular autumn viewing spots among Sapporo locals. Spreading over a vast area of a hilly country side, it is perfect for a day out hunting autumn foliage. Colourful leaves in addition to a rainbow in the Ashribetsu fall, makes a stunning autumn view. In October and November, Koen Matsuri is held where you can also get guided tours to the forest. Directions: From Makomanai Subway Station [Namboku Sen – Green line] take the Chuo Bus (Takino line 真106) to Takino suzuran koen bus stop. Tip: Plan to visit the park early in the morning, as you will have lots to see. Also, I suggest to carry your own refreshments too. Nakajima Koen is located in Chuo -Ku, which is central Sapporo. Here, in addition to a lake and two creeks, you will find several lawns and an old tea house. You can also rent a boat or enjoy a quiet picnic at the park while feeding the ducks. Directions: Just outside Nakajima Koen Subway station on Namboku Sen towards Makomanai Station. Hokkaido university is a customary location among Sapporo locals for autumn viewing. Inside the university at the Gingko avenue, several Gingko trees are lined up. In autumn, the green leaves turn into gorgeous amber colour, resulting in a spectacular display of the season. Furthermore, in early November, the Hokudai Konyo Festival is held. 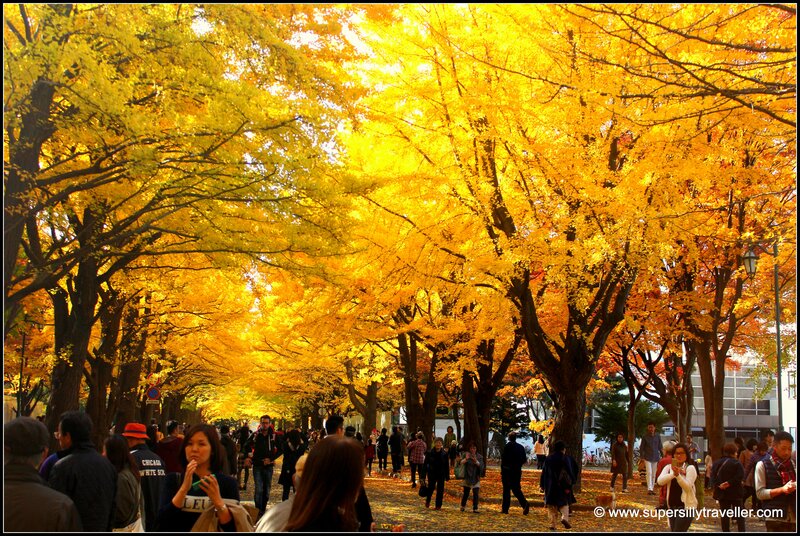 During this time, Gingko trees are all lit up against the night sky creating an attractive underpass of golden leaves. Directions: 10 minutes walk from Sapporo Station North Exit. Ishiyama open space is in Minami Sapporo. Before 1949, this place was used to mine soft stones. The southern block of the park is surrounded by rocks, artworks, and trees making it especially interesting. Moreover, it is also a good stopover on your way to Lake Shikotsu. Directions : Get off at Makomanai Subway Station on Namboku sen. Transfer to Chuo Bus to Ishiyama Higashi 3-chome bus stop, and walk 4 minutes. 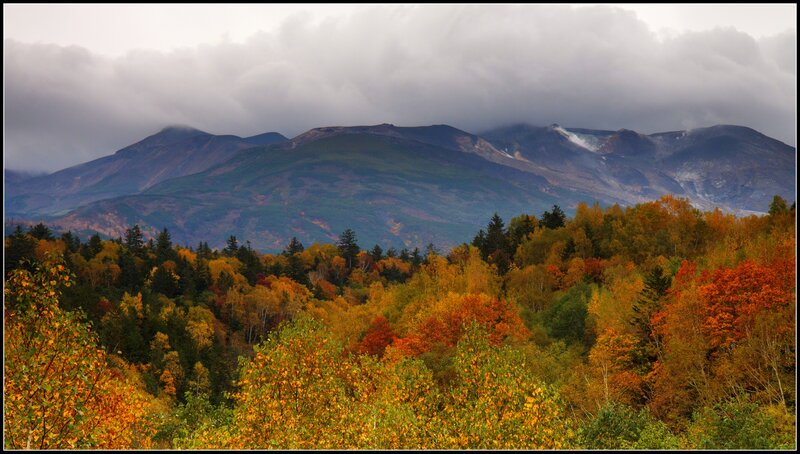 Jozankei is wrapped by tall mountains, hence it is one of the best autumn viewing spots near Sapporo. The Futami Suspension Bridge and Hoheikyo Dam are not only brilliant spots for viewing the golden leaves, but it also featured as one of the best dams in Japan. You can make it a day trip from Sapporo and relax at the Hoheikyo Onsen ( Bus and Onsen package 1800 JPY). Or, you can hop on to the Momiji Kappa Bus from Sapporo and go on a site seeing tour around the town. Noboribetsu is the most popular onsen region in Hokkaido. It sits on the same latitude as Tuscany in Italy. 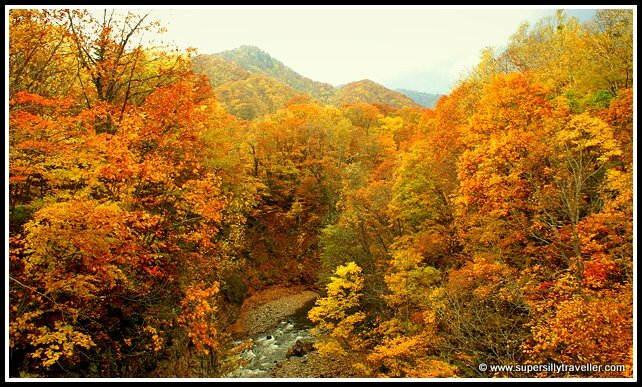 Noboribetsu prides itself in exhibiting the opulence of colours covering the mountains and valleys in October. Demon`s fire trail from May 1st to November 30th in Jigokudani should not to be missed if you are here during the fall season. Lake Shikotsu is a part of the Shikotsu –Toya National Park. The lake is surrounded with beautiful forests giving it a glorious look in autumn. It is popular among onsen lovers too. You can rent a boat and enjoy the serenity of the lake. While you are here, dont forget to eat some delicious Cheese Ageimo (fried potatoes). Lake Shikotsu is good for a day trip from Sapporo. Sounkyo was discovered by Ainu people. It is one of the first places in Japan where you get to see the autumn extravaganza. It is located at the foot of Mt. Kurodake in Daitsesuzan National park area. Sounkyo has beautiful waterfalls, rivers, valleys, gorges and hot springs too. To get the best view of the Daisetsuzan, get on the Sounkyo Ropeway to the Kurodake lift which will take you to 1700 feet above sea level. Akan is located at the center of Hokkaido and is the oldest national park of the island. 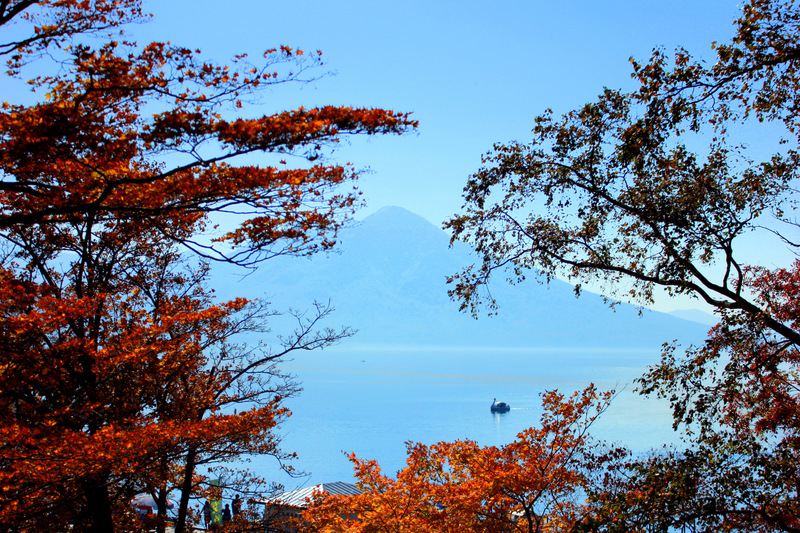 Lake Akan, is on the western side of the national park with a lakeside hotspring Akanhoken Onsen. Lake Kussharo and Lake Mashu are towards the Kawayu Onsen side. It is a magical place in all season, with a strong Ainu culture influence involved. Lake Onuma is in the Onuma Quasi National Park. It was formed in 1958 due to the volcanic activities of Mount Komagatake. Onuma Park (Onuma Koen) is revered in Hokkaido for its beauty. It is also good for a side trip from Sapporo to Hakodate. Bus : Approximately 60 minutes. Catch the “Onumakoen via Shikabe bound” to Onumakoen bus from Hakodate JR Station. Train: Approximately 20 minutes. Catch the “Hokuto” or “Super Hokuto” train from Hakodate JR Station and get off at JR Onumakoen Station. Shiretoko is an untamed sanctuary of Hokkaido. It is blessed with wild nature, and is home to Ussuri brown bears, Stellar`s white-tailed eagles, Japanese Red Fox and Ezoshika Deer. 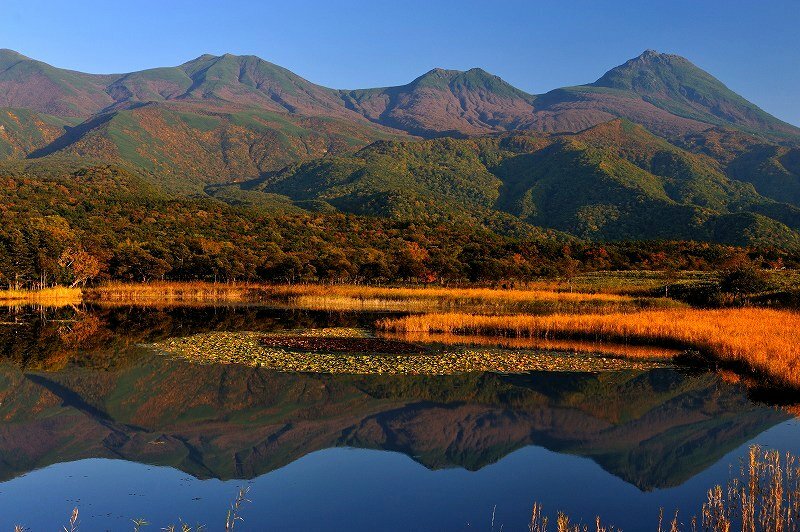 Shiretoko Goko Lakes, with Shiretoko mountain ranges around is a beautiful scenery in all the seasons. The hot spring bath at Kuma-no-yu on the Mt. Rausu side of the peninsula is a must visit if you love onsen. In autumn, you can also see Salmon and Trout running upstream in the rivers. It is a popular place among all anglers in Hokkaido and we too had our share of fishing trip here. Best time for Autumn viewing in Shiretoko : Early to mid-October. Which Seafood is the best in autumn? Although the best season for seafood in Hokkaido is winter and spring, you can still enjoy autumnal delicacies such as Abalone in Shakotan (October – December), Snow crabs and Squid in Wakkanai, and Salmon in Shiretoko and Abashiri. Here is a more detailed seafood guide on Hokkaido. From mid September to early October, Sapporo celebrates an extravaganza of food and wine at the Autumn festival in Odori Koen. Do let me know which is your favourite place for Kanpukai by commenting below. Or feel free to write any questions or comments. Hi i enjoyed reading your post especially it helps me to have better idea on how to plan for my next trip to Hokkaido. I am planning to travel during the following period but wonder which one will be ‘safer’ to get to see beautiful foliage and coral grass. Sorry for the delay in getting back to you. 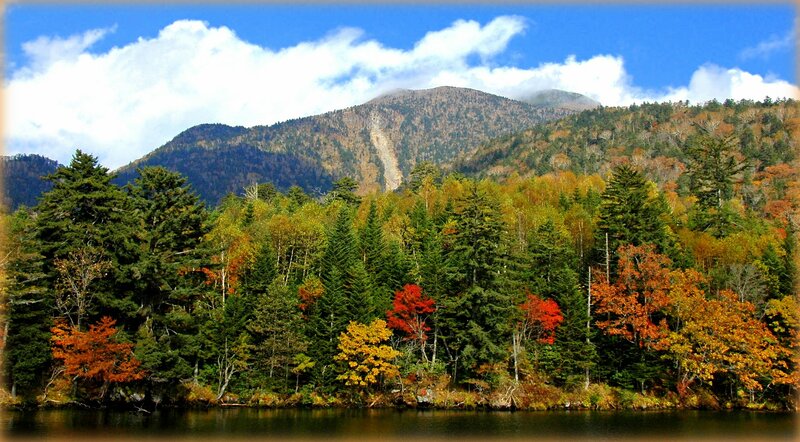 Just like the cherry blossoms, foliage period also changes every year. However, as long as are you in Hokkaido by late September-mid of October your chances of seeing autumn leaves are fine I guess. Good luck. Hi! Thank you for your post very helpful! 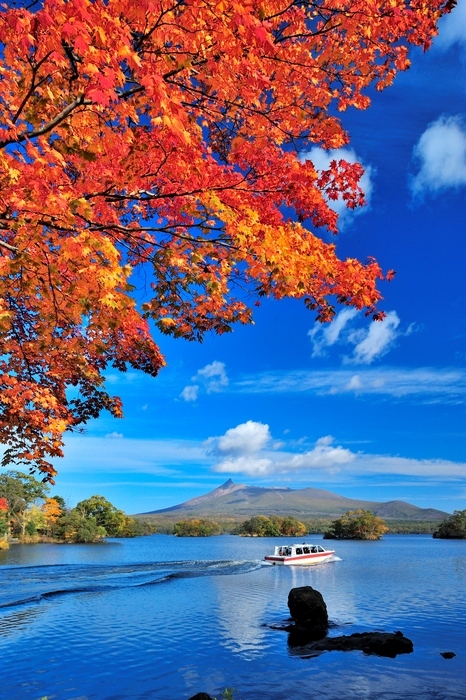 We wish to visit Hokkaido during autumn too, do you think October 21-31 will be too late? We don’t plan to do hiking we are keen to visit parks/garden and zoo since we have a toddler with us. By the way, we plan to visit Tokyo too. Thanks and all the best! I love Hokkaido and through this website I am sharing my love with you all. Jump in, browse and share your love for Hokkaido. Copyright © 2018 Supersilly Traveller. All rights reserved.